M15 (NGC 7078) is one of the most impressive examples of a globular star cluster in our Milky Way galaxy. At a distance of about 33 600 light years, its diameter of 18.0 arc min corresponds to a linear extension of about 175 light-years. Its overall spectral type has been determined as F3 or F4. 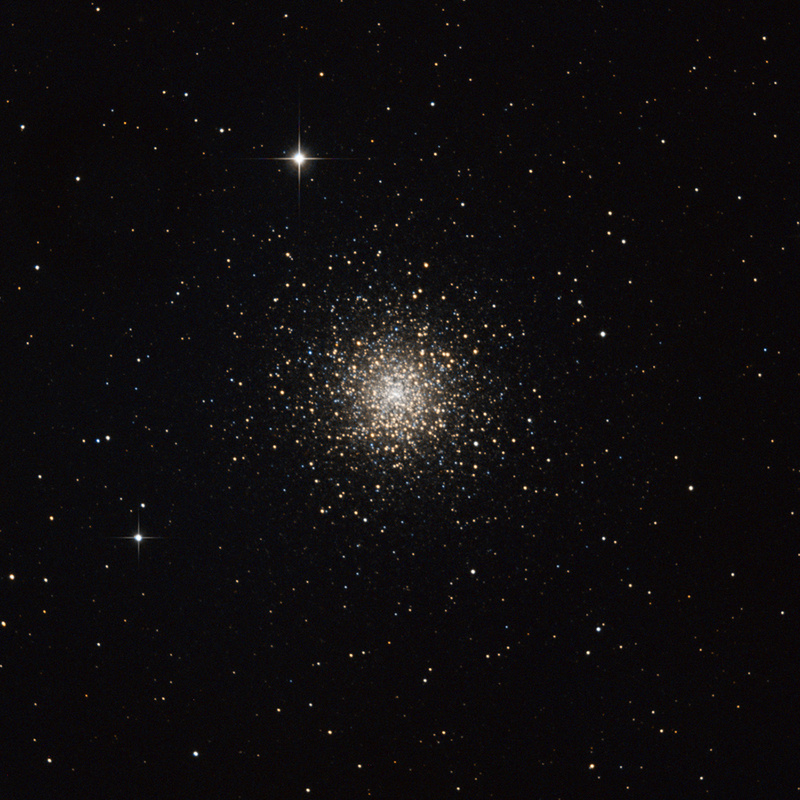 M15 is perhaps the densest of all (globular) star clusters in our Milky Way galaxy. M15 is the most popular candidate for seeing a process known as core collapse . Simulations of the behavior of rich gravitating systems (such as globular clusters) suggest that transfer of energy between cluster members as they pass close to one another should systematically drop a fractio of them into an unstable core. This central core is extremely small compared to the cluster, only about 0.14 arc minutes in angular diameter, corresponding to a linear extent of roughly 1.4 light years. It is still unclear if the central core of M15 is packed so dense simply because of the mutual gravitational interaction of the stars it is made of, or if it houses a dense, supermassive object, which resemble the supermassive objects in galactic nuclei. This globular cluster has the third rank in known variable star population, after M3 and Omega Centauri, a total of 112 variables have been identified. One of them is apparently a Cepheid of Type II (a W Virginis star). M15 was the first globular cluster in which a planetary nebula, Pease 1 or K 648 ("K" for "Kuster"), could be identified (Pease 1928, on photographic plates taken at Mt. Wilson in 1927). Pease 1 remains one of only four known planetary nebulae in Milky Way globular clusters. Moreover, globular cluster M15 contains the considerable number of 9 known pulsars, neutron stars which are the remnants of ancient supernova explosions from the time when the cluster was young. These have the designations PSR 2127+11, as well as PSR 2127+11 A to 2127+11 H. The most interesting of these objects is PSR 2127+11 C, which is apparently a component of a neutron star binary, i.e. it has a companion which is also a neutron star (S.B. Anderson et.al., Nature 346:42 (1990), T.A. Prince et.al., ApJL 374:L41 (1991)).